Large banners saying "Prepare yourself for the coming of the Messiah!" have been shown in the whole of Israel for several years. "Blessed be You, Lord, our God, King of the Universe, who performed miracles for our forefathers and for us at this place!" The museum is open from Sunday to Friday 9 a.m. - 2 p.m.. In front of this Bet HaAzma'ut where the State of Israel was founded you can see in the middle of the street a monument which shows the building up of Tel Aviv. At the base of the monument a Bible verse from Jeremiah 31:4 says: (God speaks:) "Again, I will build you, and you shall be built, virgin of Israel." The 2 main words (אבנך ונבנית ("I will build you, and you shall be built.")) of this Bible verse Jer 31:4 are inscribed in the coat of arms of Tel Aviv. Therefore You can find these 2 words with very small letters on all gullies in Tel Aviv, which all are decorated with a small coat of arms. The Eretz-Israel-Museum is situated in the north of Tel Aviv. At the fence of the museum area in HaUniversita street, at the crossing Reading street, there is a well inscribed with a quotation from Isaiah 21:14: "Bring water to them who are thirsty!". In the museum area, the section "Man and His Work" (shown on the map no.18) located just behind the entrance to the right certainly deserves special attention. There, tools typical of the world of work in biblical times are exhibited and illustrated with quotations taken from the Bible. The museum is open from Sunday to Wedneesday, 10 am- 4 pm, on Thursday from 10 a.m. to 8 p.m., on Friday and on Shabbat from 10 a.m. to 2 p.m.. In the south of Tel Aviv near Jaffa at the southern end of the Gan (garden) HaKovshim beside the mosque near the Mediterranean coast there is a monument (picture) from the war of independence and inscribed with words from 2 Samuel 1:23: David mourning for his friend Jonathan and King Saul: "they were swifter than eagles, they were stronger than lions.". In Jaffa, there is Mifratz Shlomo street, which is a little higher than the shore and runs parallel to it, leading to the main place. Near the wall level with the museum of antiques, there is an intact well where you can quench your thirst. A quotation from Isaiah 44:3 is inscribed above it: "(The Lord speaks:) I will pour water upon him who is thirsty." In the south of Tel Aviv, there is the Lehi museum which presents the history of the Lehi group, the third and smallest group of Jewish fighters (besides Haganah and Irgun) which was active under British rule. This group fought above all against the British enactments prohibiting the immigration of Jewish refugees coming from the sphere of influence of the Nazis. The Lehi group was integrated into the Israeli army "Zahal", after the foundation of the State of Israel. At the museum, you can see group commander Abraham Stern´s Bible with the words he had underlined and his tiny psalm prayer book, which he nearly always had on him. Furthermore, you can read quotations from the Bible in several places: Psalm 144:1: "Blessed be the Lord my strength, who teached my hands to war, my fingers to fight." and Isaiah 30:22: "And in battles of wielding will he fight with them." The first part of Isaiah 58:1 ("Cry aloud, spare not, lift up your voice like a trumpet.") is inscribed above the model of a secret transmitter station. The museum is in Stern street 8. (This very narrow street runs west of and parallel to HaKishon street, between Florentine and Emeq-Yisrael street.) The museum is open from Sunday to Thursday, 9 am- 4 pm. During the Gulf War in January 1991, it was through a great miracle that many people were preserved from being killed by a direct hit of a Scud rocket. Out of their gratitude to God, the Israelis established a public monument representing 6 wings and inscribed with 2 words from Exodus 25:20: The Cherubim "sochechim bekanfeham "(in Hebrew letters: סככים בכנפיהם ) (covering with their wings (protecting)). You can find this monument as follows: You drive Lehi Road (No. 461) towards Tel Aviv. Before the Ayalon valley (behind the Etzel Street) turn right to HaTiqwa road. After 200 m you can go left to the schoolyard of the Beit Moisewitsch (Beit Dani) where you can see this monument of faith. In Giv’atajim in the memorial house "Yad le-Banim" (Rehov Gordon, 26) a Hebrew Bible verse is inscribed from Ezekiel 37:14: God says: "I will put my spirit in you and you will live". The oldest part of Petah Tiqwa is near Kikar HaMejasedim (Founder's Square) in the city centre, south of the central bus station. In a corner of the place, you can see a modern water dispenser, which is located where the city founders drilled the first well. In Howewei Zion Street, which leads to Kikar HaMejasedim, there is a synagogue which dates back to the time of the city foundation (in 1890). In Petah Tiqwa there is a complex of several museums (called "Qiryat HaMuse´onim "Yad LeBanim") at Independence Park, which is located in "Haim Arlozoroff" Street in the western part of Petah Tiqwa. This museum complex consists of a memorial park, a historical museum which illustrates the settlement´s foundation by the Zionists, the Holocaust museum, the museum which commemorates the soldiers from Petah Tiqwa killed in action, and the art museum. In the memorial park, further away from the street, there are some armoured vehicles of the Israeli army, and a white commemorative stone which bears the names of several soldiers killed in action, and a quotation in Hebrew from 2 Samuel 1:19: "The beauty of Israel is slain upon thy high places." In the historical museum, which shows the settlement´s foundation by the Zionists, you can see many exhibits and models of the first houses and synagogues. Furthermore, an excellent film in English about the history of Petah Tiqwa is shown there. "How are the mighty fallen, and the weapons of war perished." (2 Samuel 1:27); "The beauty of Israel is slain upon thy high places." (2 Samuel 1:19); David mourning for his friend Jonathan and King Saul: "they were swifter than eagles, they were stronger than lions." (2 Samuel 1:23). In the same commemorative room, you can see a relief showing a mother (like Rahel) mourning the death of her son killed in action. Beside it, there is a quotation in Hebrew from the Bible: Jeremiah 31:15: "she refused to be comforted for her children, because they were not." In the corridor the following wall mosaics showing biblical themes are to be found: construction workers near the walls of Jerusalem and an armed soldier, which illustrates Nehemiah 4:11: "every one with one of his hands wrought in the work, and with the other hand held a weapon", then a tree stump on which a new shoot is growing; beside this image you can see a dead soldier and a strong soldier standing there with his sword in the sunlight. This represents the people of Israel regaining strength, with their own army in the land of Israel, according to Isaiah 6:13: "And the Lord have removed men far away, and there be a great forsaking in the midst of the land. ... when they cast, the holy seed shall be the substance thereof." On the outside wall of the building, there is also a mosaic showing a soldier carrying an arc and an arrow. This is explained in Hebrew by 2 Samuel 1:18: (David) "ordered that the men of Judah be taught the use of the bow." The museum (Website) is open from Monday to Thursday, 4.30-7.30 pm, on Shabbat from 10 am to 1 pm, Fridays and Sundays closed. The religious kibbuz Be´erot Yitzchak is located on road 40 south of Petah Tiqwa. This kibbuz was situated near Gaza until the War of Independence; later the inhabitants of Be´erot Yitzchak were allowed to settle down near Petah Tiqwa where they are a little safer; for they had to endure especially great sufferings because of both the Holocaust and the Egyptian attack during the War of Independence. The inhabitants of the kibbuz live according to the principle: "pray (read the bible) and work (defend yourself)". Documentation for visitors is under preparation. Two moving films about the kibbuz inhabitants´ history, faith and life are available at present only in Hebrew, but will soon be translated into German and English. Visitors are recommended to contact Mr. David Porat (phone in Israel: (0 52) 57 42 68 or (03) 937 18 83) who is fluent in English and will be pleased to give you more details. The memorial of the Signal Corps in Yahud contains 2 times a hebrew Bible verse from Ezra 3:13: "The sound was heard far away": at the main memorial and at a smaller one. 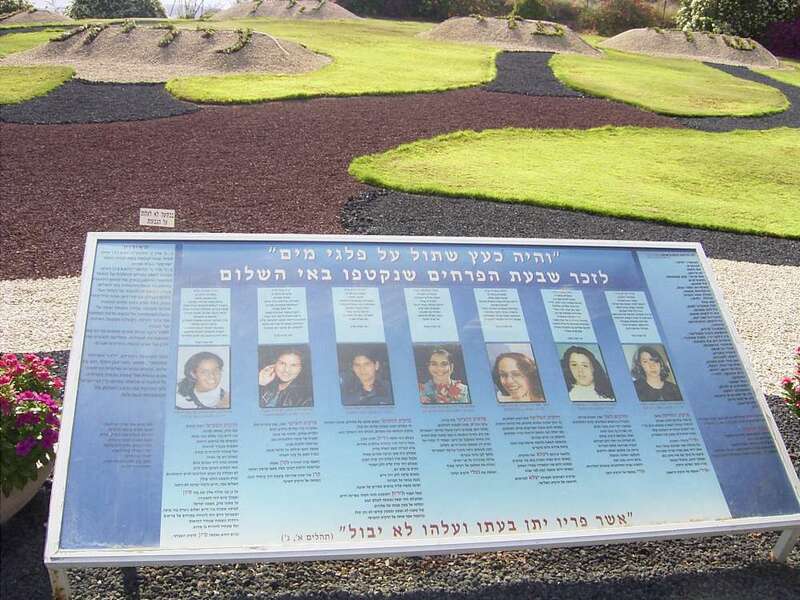 In Rehovot there is a memorial for the victims of the helicopter collision in 1997 (See below chapter 1.7..) at the wall of "Or leGil"-Synagogue, which is inscribed with the Hebrew Bible verse from Psalm 42:5: "These things I remember, as I pour out my soul ... to the house of God". A second memorial stone for these fallen in Karob Park is inscribed with a Hebrew Bible verse from 2 Samuel 1:23: "they were swifter than eagles, they were stronger than lions". Driving southwards on road 444 from Rosh HaAyin, you get to the crossing "Zomet Modi´im". After the town Beit Nehemya, immediately before arriving at this crossing, you can see the Memorial to the Maintenance Brigade on your left-hand side. On the memorial, you can read a quotation from Nehemiah 4:11: "every one with one of his hands wrought in the work, and with the other hand held a weapon." Near the new city of Modi'im is the Biblical plant garden and experience park Ne'ot Kedumim (נאות קדומים ). There are 4 tours, which take approximately 1-2 hours. Very good brochures are available at the entrance, containing explanations of the plants mentioned in the Bible, plants You find next to the foot paths. In brochures and on boards beside the plants, you can read quotations from the bible relating to these plants. Additionally, you'll find excavations and things from the daily life life in biblical times (e.g. sheep watering places , watchtower in the vineyard, etc.. It is possible to go down into a cistern and feel like Joseph and Jeremiah when they were prisoners.). Ne'ot Kedumim is situated between Tel Aviv and Jerusalem near the road 443, which runs parallel to and north of the highway 1. Turn some kilometers east of Ben Shemen from the road 443 to the north and after 200 m you'll be in Ne'ot Kedumim. You'll find signs on the road 443. Ne'ot Kedumim is open from Sunday to Thursday 8:30 a.m. - 4:00 p.m. (Visitors may stay in the reserve until sunset. ); Friday: 8:30 - 1 p.m.. The garden is closed on Shabbat and Jewish holidays. Driving on road 443 from Ne´ot Kedumim several kilometers further towards Jerusalem, you will notice large signs "Maccabean Graves - Hashmonean Village".There you turn off from the main road, then turn left to the Maccabean Graves (and not the Hashmonean Village). There, you turn left again to a parking space, or you continue several hundreds of meters until you see a footpath lined with trees on your left-hand side. Both ways lead to a memorial reminiscent of the fierce combats which took place during the War of Independence, there in the former border area between Israel and Jordan. In a short tunnel in the memorial, you can read a quotation from 2 Samuel 1:23: David mourning for his friend Jonathan and King Saul: they were swifter than eagles, they were stronger than lions." At the end of Emeq haEla (Terebinth Valley) You'll find the place of the biblical town of Azekah (beside Britannia Park), mentioned in the biblical story of David and Goliath. (1 Samuel 17:1) If You ascend to the excavations on the top, You will pass many plates, inscribed with Hebrew verses from this story in 1 Samuel 17. The Israeli tank museum "Yad LaShirion" in Latrun in the Ayalon valley is connected with the Bible verse Joshua 10:12-13 which is about God's assistance for the defence forces of Israel and which you find in the museum at different places: "Sun, stand you still upon Gibeon and you, Moon, in the valley of Ayalon. Then the sun stood still and the moon stayed until the people had punished their enemies." The museum is open Sunday to Thursday from 8.30 a.m. to 5.30 p.m; on Friday from 8.30 a.m. to 1.30 p.m., on Shabbat and Jewish holidays from 9 a.m. to 5 p.m.. If you turn off the motorway Tel Aviv - Jerusalem at Latrun junction to road No. 3 to the south, and turn right the next road behind Nahshon junction in the direction of Hulda, you will find after 200 meters the monument of valor ("Matsevet HaGevura") with a column located on a small hill. This monument was built to commemorate the defense of Jerusalems by the Israeli army during the War of Independence. On the column is written: "If I forget, You, Jerusalem, then my right hand shall be absent." (Psalm 137:5). Over the boards commemorative of the fallen soldiers, a verse of Isaiah 2:4 c is written: "nation shall not lift up sword against nation, neither shall they learn war any more." Near the road Tel Aviv - Jerusalem, if you turn to the south to the road 38, you'll find a monument for the Machal(מחל)-volunteers after 500 m on the left side of the road 38 (fighters), i.e. a monument built in memory of the foreign - partially non-Jewish - soldiers, who fought voluntarily for Israel during the War of Independence. There is the Bible message Joshua 1:14: "All those of valour shall pass armed among Your brethren, and shall help them. " Driving on the secondary road 395 between Eschta´aol and Jerusalem (parallel to main road 1), you turn off near Ramat Raziel in the direction of Megillat Esh (Fire Scroll). Moving several kilometers further, you get to two scroll-shaped bronze monuments several meters high erected in commemoration of the millions of Jews who perished in the fire of the Holocaust. The scrolls show many pictures representing scenes of Jewish history from biblical to modern times including the revival of Jewish civilization brough about by Zionism. Between the two scrolls you can read a quotation from Ezekiel 37:12+14 in Hebrew and English: "Thus saith the Lord God: Behold, o my people, I will open your graves, and cause you to come up out of your graves and bring you into the land of Israel. ... And shall put my spirit in you, and ye shall live, and I shall place you in your own land." Near Main Road no. 1 between Tel Aviv and Jerusalem, there is the memorial for those who during the War of Independence in 1948 succeeded in breaking through the enemy lines around Jerusalem, which was then under siege. You will see the memorial standing on the slope of a mountain. The memorial consists of a number of poles sticking out of the slope like the foundations of a bridge under construction on the road to Jerusalem. When driving eastwards (in the direction of Jerusalem), you can reach the memorial from Main Road no. 1 by turning northwards immediately after the junction Bet Meir but before the junction Newe Ilan / Abu Gosh. There is a parking lot very close to the main road. From there, you can walk upwards to the memorial. On the left of the memorial, partially covered by a bush, there is a plaque inscribed with a quotation in Hebrew from Isaiah 62:1: "For Zion's sake will I not hold my peace, and for Jerusalem's sake I will not rest." To get to the memorial and to the lookout tower on the "Radar Hill", you should turn off Main Road no. 1 at the eastern junction to Abu Gosh (and Qiryat Anavim). Then, before Abu Gosh, immediately turn northwards in the direction of Qiryat Anavim. Pass through Qiryat Anavim towards Ma'ale Hahamischa. Just before Ma'ale Hahamischa turn right into the mountain road leading to Har Adar ("Radar Hill"). In Har Adar, follow the signposts indicating "Harel Brigade Monument". You will also clearly see the lookout tower on "Radar Hill" on the right of the road. Until 1967, the "Radar Hill" was a Jordanian position from which they controlled the nearby main road from Tel Aviv to Jerusalem. The position was fiercely disputed in 1948 and in 1967. In the tower, there is a commemorative plaque inscribed with a quotation from 2 Samuel 1:19 in Hebrew: "Upon thy high places slain" (O, Israel). On the west side of Jerusalem's old city wall, rather in its north-west corner, there is a white stone on the ground. On it, you can read a quotation from Psalm 122:3-4 in Hebrew and English: "Our feet are standing in your gates, O Jerusalem. Jerusalem, you are built as a city which is compact together." A bit south of the north-western corner of the city wall (which means north of the Jaffa gate) You find a memorial stone for a policeman, who was killed here. The stone is inscribed with Isaiah 62:6; "I have set watchmen upon Your walls Jerusalem." A quotation from Nehemiah 4:1 is inscribed on the city wall, immediately to the left of the Jaffa gate: "that the walls of Jerusalem were made up." In the Jaffa gate, on the northern side, there is a small display-case in which you can read a quotation from Psalm 122.6: "Pray for the peace of Jerusalem!" in several languages. West of the old city, 500 m south-west of the Jaffa gate, there is the picturesque quarter Yemin Moshe. The wonderful view of the old city , the beautiful paths running along flowerbeds make this place a romantic inside tip for visiting Jerusalem, especially by night. At the southern end of HaTiqwa path (south of HaMetsuda path), on a platform embellished with luxuriant vegetation (stairs above HaTiqwa path) to the south, you can find a stone inscribed with a quotation from 1 Samuel 2:26: "More and more the child Samuel grew on, and was in favour both with the Lord, and also with men." The "Teddy Park" between the Jaffa gate and Yemin Moshe was inaugurated in 2013. There You can find - beside the fountain - a sundial with a Hebrew Bible verse from the book Ecclesiastes (Kohelet) 1:4-6: "Generations come and generations go, but the earth remains forever. The sun rises and the sun sets, and hurries back to where it rises. The wind blows to the south and turns to the north; round and round it goes, ever returning on its course." Just south of the Jewish Quater of the Old City You find the original area of Jerusalem, the City of David ("Ir David"). Just behind the entrance of the excavations You find in the court left-hand verses of Psalm 122, written on a stone in English, f.e. : "Our feet stood within your gates O Jerusalem. ... Pray for the peace of Jerusalem." Beside the Gihon spring You find the historical Bible verse from II Chronicles 32:30: "This same Hezekiah also stopped the upper spring of the waters of Gihon, and brought them straight down on the west side of the City of David." In the west of the City od David and south of the old city on Mount Zion, there is the "Chamber of the Holocaust" memorial which was built before Yad WaShem. A quotation from Obadiah 17 in Hebrew and English:"And on Mt. Zion there will be a sanctuary for survivors and it will be holy." is inscribed above the entrance. Beside the entrance, you can also read a quotation from Genesis 4:10 in Hebrew: God said to Cain after Cain had killed his brother Abel: "Thy brother's blood crieth". In the yard, you can read a quotation from Jeremiah 31:14: "A voice was heard from on high, lamentation and bitter weeping; Rachel weeping for her children; she refused to be comforted for her children, because they are not." - on the memorial to the children murdered in the Holocaust. In the rooms at the rear, which are marked with a "T", there are black commemorative plaques bearing the names of people who were murdered. Above these plaques, the following quotations from the Bible are written in the shape of arches: Job 16:18: "O earth, cover not thou my blood"; Psalm 42:5: "When I remember these things, I pour out my soul in me. "; Joel 4:21: (God says:) "For I will cleanse their blood, that I have not cleansed: for the Lord dwelleth in Zion." In order to get to this memorial, take the footpath straight through the Zion gate, keeping a little to your left-hand side. Opening hours: Sunday to Thursday from 8 am to 5 pm, and on Friday from 8 am to 1 pm. South-west of the old city opposite Zion mountain, a bridge for pedestrians crosses Derech Hevron street which leads to the South (Bethlehem, Hebron). Beside it is St.Andrews church. At the western end of the bridge, there is a peace memorial. Below it, you can see parts of scrap weapons, which are welded together to form kinds of farming tools. On them, a white column rises up, which is inscribed with a quotation from the 2nd part of Isaiah 2:4. in Arabic and Hebrew: "And they will beat their swords into plowshares and their spears into pruninghooks. Nation will not lift up sword against nation, neither will they learn war any more." This evokes the hope that one day even Israel will no longer need an army to ensure its survival. Further to the south of Jerusalem, in the quarter Talpiyot, on Hebron Street no. 101, there is a large white building of the telephone company Beseq. On the facade of this building, there is a mosaic showing water, land and a rainbow. Below it, a quotation from Genesis 9:13 is written in Hebrew: (God says:) "I do set my bow in the cloud, and it shall be for a token of a covenant between me and the earth." To the far south of Jerusalem, there is the kibbutz Ramat Rahel, with the large kibbutz hotel Mizpe Rahel. On the left of the hotel entrance, in a park, you will find a sculpture a bit hidden by the bushes close to the park's first green. The sculpture represents Rahel with a sad face hugging two children. The sculpture is related to the nearby grave of Rahel, who died when giving birth to her second son Benjamin, and evokes Jeremiah 31:15: "Rahel weeping for her children refused to be comforted for her children, because they were not." Under the sculpture, you will notice a quotation from Jeremiah 31:17 (in the same chapter as the above-mentioned quotation): "Thy children shall come again to their own border." This quotation is God's promise to save her children, in response to the suffering she expressed before. The wall of the hotel lobby is inscribed with Genesis 13:8 in many languages (including German): "So Abram said to Lot: Please let there be no strife between me and you, and between my herdsmen and your herdsmen, for we are kinsmen." We strongly recommend the Bible-Lands Museum in Jerusalem. The museum is structured according to the different periods of biblical history. The exhibits in every department are illustrated with numerous quotations from the Bible. This museum is much more interesting than the Israel museum directly beside it. Standing in front of the entrance of the Israel museum, you will see the Bible Lands museum 100 m to the right. It is open from Sunday to Tuesday and on Thursday from 09:30 am to 05:30 pm, on Wednesday till 09:30 pm, on Friday from 09:30 am to 02:00 pm and on Saturday from 10 am to 03:00 pm; it is closed on Jewish holidays. In Yad WaShem, over the entrance to the labyrinth built in commemoration of the 1 500 000 Jewish children murdered, you can read a quotation from Proverbs 20:27: "The spirit of man is the candle of the Lord." In the labyrinth, a candle light is reflected by thousands of mirrors. Right at the entrance to the new Shoah main museum, you can read a verse from Joel 1:2-3: "Has the like of this happened in your days or the days of Your fathers? Tell Your children about it, and let Your children tell theirs, and their children the next generation." written on a concrete plate in Hebrew and English. There is also a memorial, which commemorates the victims of the death marches between the concentration camps: A sculpture with many emaciated walking human bodies and a metal plate with a verse from Jeremiah 8:23: "Oh that my head were waters, and mine eyes a fountain of tears, that I might weep day and night for the slain of the daughter of my people." Yad WaShem is open from Sunday to Wednesday from 9 am to 5 pm, on Thursday from 9 a.m. to 8 p.m. and on Friday from 9 am to 2 pm. It is closed on Shabbat and Jewish holidays. Jesaja 11,11: "An jenem Tag wird der Herr seine Hand von neuem erheben, um den übrig gebliebenen Rest seines Volkes zurückzugewinnen, von Assur und Ägypten, von Patros und Kusch (=Äthiopien), von Elam, Schinar und Hamat und von den Inseln des Meeres." Directly beside Yad WaShem, on the road "Sderot Herzl" is Mount Herzl with its north entrance towards the military cemetary and its south entrance towards the Herzl Museum, the Herzl grave and the graves of important figures of the State of Israel and the memorial to the victims of terrorism. All Bible verses on this cemetary are written in Hebrew. We'll on a round trip starting through the (northern) main gate, going up, turning to the right (southwards) and then turning back eastwards, finally arriving at the second (northern) gate. - Going up half the way You'll get to the graveyard lf the fallen of the Lebanon war and You'll find there in a corner the Bible verse from Jeremiah 31:15: "Rahel weeping for her children refused to be comforted for her children, because they were not." - A little higher up, there is a memorial made of white stones where a quotation in Hebrew from Jeremiah 31:20 is inscribed: (God speaks:) "For since I admonished him, I do earnestly remember him again and again." - Going down on the northern side you will see a concrete model of the submarine "Dakar" which disappeared in the Mediterranean Sea in 1968. On the boat model a Bible verse is written from Psalm 77:19:"Your path led through the sea, your way through the mighty waters, though Your footprints were not seen." - On the opposite side, you'll find the memorial for the fallen Jewish naval soldiers of the SS Erinpura and can read a quotation in Hebrew from Psalm 68:22: "The Lord says: "I will bring them from Bashan; I will bring them from the depths of the sea". - Nearby You'll find an archway to commemorate the fallen defenders of the old oity of Jerusalem in 1948. There you can read quotations in Hebrew from Jeremiah 31:8: "(God speaks to the people of Israel) I shall gather them from the uttermost parts of the earth." and Isaiah 66:14:"Your bones shall flourish like the grass." - Further down You'll find the memorial for the fallen Jewish soldiers in the Polish army during the second world war with the Bible verse from 2 Samuel 1:23: "they were swifter than eagles, they were stronger than lions." - Nearby You'll find for the second time in this cemetary the Bible verse from Jeremiah 31:20: (God speaks:) "For since I admonished him, I do earnestly remember him again and again." -Not far away You'll find memorial for the fallen Jewish soldiers in the Soviet army in World War 2. It is inscribed with a Bible verse from Judges 3:2: "Because of the knowledge of the generations of Israel", to teach them warfare. - Finally You'll get near the northern gate to the memorial for the Ethiopian Jews, who were killed or died on their way to Erez Israel. There You'll find the Bible verse Isaiah 11:11: "In that day the Lord will reach out his hand a second time to reclaim the remnant that is left from his people from Assyria, from Lower Egypt, from Upper Egypt, from Cush (=Ethiopia), from Elam, from Babylonia, from Hamath and from the islands of the sea." - In the immigrant's section the victims are buried, who died on the drowned immigration-ship "Egoz", set sail in 1961 from Marocco. On the bottom of the memorial stone You'll find in Hebrew the Bible verse from Psalm 69:15b: "Do not let the depths swallow me up or the pit close its mouth over me." - Mount Herzl is open from Sunday to Thursday from 8 am to 5 pm and on Friday from 8 am to 2 pm and on Shabbat and Jewish holidays from 9 am to 6 pm. - Website of new, highly recommended Herzl-Museum near Mount Herzl. In "Kiryat Moshe"-district south of the Central Bus Station at the corner of David-Wolffsohn-Street and Herzl-Boulevard (light rail) You'll find a standing mosaic, showing a lion and a pigeon (of peace) under a rainbow together with a Bible verse in Hebrew from Amos 1:2: The Lord roars from Zion and thunders from Jerusalem. In the Central Bus Station You find on the upper level above the stairs Bible verses in big Hebrew letters:"Pray for the peace of Jerusalem: May those who love You be secure. May there be peace within Your walls and security within Your citadels. For the sake of my brothers and friends, I will say: 'Peace be within You.' (Psalm 122:6-8)"
Near the central bus station on the south-east side of the crossing Nordau street / Yafo street, there is a memorial to the victims of a terrorist attack which took place there. You can see a bomb cut open and read inscriptions in Hebrew such as: "Despite the terror, fear will not prevail." At the bottom, you can read: "God will wake their blood (i.e. the victims) up again." At the crossing HaNevi'im street/Yafo street, at the place "Kikar HaHerut", there is a monument with a Davidka, a small, self-produced Israeli mortar from the War of Independence. This weapon was used during the time of defence of the besieged Jerusalem. On the monument, you can read a sentence from 2 Kings 19:34 in Hebrew: (The Lord says:) "I will defend this city, to save it." In Jerusalem, at former Mandelbaum Gate border crossing between Israel and Jordan (1948-1967), there is a museum called "Museum on the Seam" (Address: Jerusalem, 4 Chel Hadassah Street, near Kikar Pikud Merkaz, in the long main street leading from Damascus Gate northwards): This museum hosts art exhibitions about the problems between the different population groups living in Jerusalem, and is dedicated to furthering peaceful coexistence between them. In its entrance hall, you can see a large wall inscribed with a quotation from Genesis 13.8 in many languages (including English):So Abram said to Lot: Let's not have any quarreling between you and me, or between your herdsmen and mine, for we are brothers. Opening hours: Sunday to Thursday: 10 am to 5 pm, Friday: 10 am to 4 pm, closed on Shabbat. Eastwards there is in the compound of the university hospital on Mount Scopus a memorial situated for the 87 victims of an Arab massacre on 13th April 1948 against a convoy heading for this university hospital. Then in this convoy doctors, nurses, patients and professors were murdered. Above the names of the victims 3 Hebrew words are inscribed - from Zephaniah 3:19: God says: "I will give them praise and honor." In Jerusalem, you can find a biblical plant path, in the botanic garden of the university at Givat Ram. The biblical plant path is in the rear/northern area of the botanic garden. 40 biblical plants are illustrated there with detailed English-language explanation boards including relevant quotations from the bible. In Jerusalem there is a Biblical Zoo, where many animals can be seen, which are mentioned in the Bible. On the information boards in front of the cages of the animals you'll find the Bible verses of the animals written in Hebrew and English, so that the visitor becomes more familiar with the Bible through these animals. The zoo is situated in the south of Jerusalem, in the quarter "Manachat" at the end of the street "Derech Gan HaKhayot", to which you turn southwards off the motorway "Eliyahu Golomb". The zoo is open Sunday to Thursday 9 a.m. - 7 p.m., Friday 10 a.m. - 4.30 p.m., on Shabbat and Jewish holidays: 10 a.m. - 6 p.m..
Driving on road 40 between Gedera and Rechovot, you can see to the west the memorial to the paratroopers whose central part bears an inscription from 2 Samuel 1:23 in Hebrew: David mourning for his friend Jonathan and King Saul: "they were swifter than eagles, they were stronger than lions." On the right column of the memorial there is an inscription in Hebrew referring to someone who is obeying God's call for the defence of Israel: "A voice called me and I went into combat." Gedera existed even in biblical times (Joshua 15:36, 1 Chronicles 4:23). It was founded in 1884 (See below chapter 2..) again by religious "Bilu" Zionists (named after the initial letters of Isaiah 2:5: Beit-Ia'akov Lechu Unelcha ("O house of Jacob, come ye, and let us walk (in the light of the Lord)!") who placed special emphasis on the observance of the Sabbat and the Sabbatical year. Isaiah 2:5 and another Bible verse is inscribed in the coat of arms (picture): We should go up and take posession of the land, for we can certainly do it." (Numbers 13,30) The meaning of the name Gedera is explained in Hosea 2:8 (6): God wants to protect Israel from the temptation to serve the Pagan gods by building Gedera (a wall for her) for Israel. Today's Biluim Street is the street where the first houses were built. Almost in the centre of the town it branches off from road 40 eastwards. First you see the town's oldest house built in 1886. Higher up there is the museum (house no. 21). The exhibits and explanations shown there are very interesting but the museum is very small. It will probably be enlarged. In the museum you can read quotations from the bible in Hebrew and English: 1 Chronicles 4:23: "These were the potters, who dwelt at Netaim and Gedera; they dwelt there in the king's service." Three quotations from the bible serve to summarize the modern history of Gedera and the whole of Israel: Isaiah 60:22: "The smallest shall become a thousand. "; Isaiah 11:12: (God will gather Israel) "from the four corners" (of the earth); Isaiah 60:22: "And the least a mighty nation." The museum is open from Sunday to Thursday from 8:30 am to 1:30 pm, on Wedneesday also from 4 to 6 pm, it is closed on Friday and Shabbat. The kibbuz Revadim is located on road 3 north of Qiryat Malachi. The Philistine city of Ekron was excavated near the kibbuz, where you can find a museum exhibiting things found during the excavations and reconstructed objects illustrating the ancient history of Israel: for example a reconstructed loom inscribed with a quotation from Judges 16:13 (Simson says to Delila:) "If thou weavest the seven locks of my head with the web". The museum is open from Sunday to Thursday from 9 am to 3 pm and on Friday from 9 am to 12.30 pm. Website 1 und Website 2. On Road No. 383, which links the main roads no. 3 and 38 together, a little west of the town Gefen, near the northern side of the road, there is the memorial for the soldiers of the Communications and Computer Unit, who were killed in action. It is a modest memorial which shows a white lightning on a blue background beside a quotation from Ezra 3:13: "And the noise was heard afar off." Gush Etzion (גוש עציון ) is a group of religious settlements founded even before the War of Independence. These were then taken and destroyed by the Jordanian army and were integrated into the Jordanian territory. After the War of 1967, the destroyed settlements were reconstructed. The museum of the history of Gush Etzion is located in the so-called German Monastery of the settlement Kfar Etzion (כפר עציון ; the reconstructed building was the settlers' last defensive position; the arsenal was in the cellar of the building; there you can see a moving multi-media show (also in German or English) illustrating the sufferings of the settlers who even under fierce attacks did not forget to read the bible and finally accepted their defeat out of God's hands. This presentation contains many references to the bible just as the small history book and the collection of photos you can buy there. One of the photos shows a poster which was designed when the settlement was founded again in 1967: The poster shows settlers farming the land again and above this scene you can read quotations from Jeremiah 31:17: "And your children will come again to their own country." and Haggai 2:9: "The glory of this latter house shall be greater than of the former, saith the Lord of hosts: and in this place will I give peace, saith the Lord of hosts." The museum of the history of Kfar Etzion is open from Sunday to Thursday from 8.30 am to 1 pm and on Friday from 8.30 am to 11 am (contact in advance is recommended: phone: 02-993 51 60). The easiest way to reach Gush Etzion and Kfar Etzion is the new road from Jerusalem to Hebron, a road which begins in Gilo, a southern quarter of Jerusalem. Half-way from Jerusalem to Hebron, you can see clear signs indicating Gush Etzion. The museum מעוז מול עזה "Ma'oz mul Aza" ("fortress facing Gaza") is located immediately before the Gaza strip. An observation tower which dates from the War of Independence is at the centre of the museum. This tower is the only remnant of the first religious kibbuz "Sa'ad" (סעד), which was reconstructed 1 km away from this place. The whole museum is designed to illustrate the settlers' attitude "faith and work (together with fighting)". Exhibits on the ground floor serve to show this attitude: During the foundation ceremony, a Torah scroll is solemnly carried into the kibbuz. Other photos show people praying and participating in religious celebrations or involved in hard building work. In a reconstructed command post, you can find a rifle lying beside a small Torah scroll. On the first floor a film (also in English) is shown, in which they thank God for His assistance in the successful defence of the kibbuz. For instance they recognize that it was due to God's help that the first shot fired at random by the only gun in the kibbuz hit the command post of the Egyptians and caused them to retreat overestimating the Israeli fire power and intelligence. On the top of the observation tower from which you can see Gaza and the Gaza strip there is an observation table. This table was designed to record the movements of the troops of the enemy without having to violate the Shabbat commandment which forbids writing: the times of the day were shown on the horizontal axle of the table, the different kinds of troops displayed on the vertical axle. The observations made were recorded by hanging rings on hooks, the number of rings on a specific hook indicated, for example, the number of the tanks observed. To reach the museum take the road 232 which branches off from the main road 25 (Netivot - Gaza). Near the kibbuz Sa'ad, directly beside a petrol station, turn off towards Kfar Aza. Several hundreds of meters further, turn left to take a narrow road. At this point, you can see the small observation tower on top of a hill. There are no fixed opening hours. Before your visit, call Tel. (052) 3726644, 08-6800403. - at the entrance 1 Sam 14:52 (also in English): "and when Saul saw any strong man, or any valiant man, he took him unto him." - honoring plates for soldiers engaged in the operations with 2 Sam 23:8: "These are the names of the mighty men, who were with David". - A Stone honoring Ariel Sharon with 1 Maccabees 4:32: "Make them to be of no courage, and cause the boldness of their strength to fall away, and let them tremble in their destruction!" - White stones for the names of the fallen with Jos 10:19: "Don't stop! Pursue Your enemies and attack them from the rear!" - A Stone commemorating "Operation Kinneret" with Jos 11:7: "They came against them suddenly at the waters of Merom and attacked them." In the centre of Be'er Sheva, beside Kikar HaZionut, there is the Yad leBanim War Memorial. In the square is front of it, you can see a sculpture reminiscent of the victims of the Holocaust which is inscribed with a quotation from Esther 9:28: "nor shall their remembrance perish from their descendants." in Hebrew and English. In front of the Negev Brigade Memorial, you can find on your left-hand side a small stone sill inscribed with a quotation from 2 Kings 2:12: "My father, my father, the chariot of Israel, and the horseman thereof!" The Negev Brigade Memorial is located on the outskirts of Be'er Sheva, on road 60 leading northeast. Just south of road 60 leaving Be'er Sheva to the North-east you find the Biblical Tel Be'er Sheva. Inside the well excavated site You find some Bible verse, which are connected with the daily life in an ancient town, f.e. : Proverbs 1:21: "At the head of the busy streets she calls; at the entrance of the gates, in the city, she speaks out." - Proverbs 7,6: For at the window of my house I looked through my lattice"
Mizpe Revivim is an especially interesting museum. In 1943, it was established as an agricultural testing centre and named after Micah 5:7 ("showers"). (See below chapter 2.) Now, the whole area of the former agricultural testing centre is a museum comprising the centre's outdoor areas and buildings. This museum offers a lot of information about the successful undertaking to cultivate the Negev desert, which is also a fulfilment of biblical prophecies. Furthermore, the extensive fortifications still exist which proved to be very effective during the Egyptian offensive in the War of Independence in 1948. Among other things, there is a former military hospital, which was installed in an old Byzantine cavern. Next to it, you can visit completely furnished residential buildings, which date back to the beginnings of the kibbutz. In the so-called "exhibition room" in the former testing centre's main section, you can also read a quotation from Isaiah 61:4 in Hebrew: "And they shall build the old wastes, they shall raise up the former desolations, and they shall repair the waste cities, the desolations of many generations." Furthermore, there are original transport planes which, during the War of Independence, supplied the kibbutzim which were surrounded by the enemy. Visiting this museum takes several hours. In the Visitor's Building near the entrance, a very informative film is shown in Hebrew, English, Spanish and German. To get to the museum Mizpe Revivim, take the road no. 222, which is located southwest of Be'er Sheva. You need not pass through today's kibbutz Revivim, but you can take the direct access road marked "Mizpe Revivim", which turns off the main road no. 222 a little north of kibbutz Revivim. Mizpe Revivim is open from Sunday to Thursday, from 8 am to 4 pm, on Friday from 8 am to 12 am. From the 1950th Ben Gurion invited every fortnight to the "Prime Minister's Bible Study Circle" in his office, attended by rabbis and important politicians. In Eilat You'll find opposite the entrance to the old airport on the other side of Derech HaArava a date palm with a plate, on which many Bible verse, mentioning the date palm (tamar), are inscribed: Exodus 15:27, Leviticus 23:40, Pslam 92:13, Song 7:8. Additionally there is inscribed Deuteronomium 8:8, because the honey, mentioned there, is probably date-honey. East of Netanya near Qaqun there is a memorial of the Alexandroni Brigade with a Bible verse from Zephaniah 3:19: God says: "I will give them praise and honor." The Border Police Memorial and Heritage Center is located in the western Carmel mountains. It is not easy to find. Driving on road 65 (Afula - Hadera), you turn south at the "Zomet Iron" junction. Only 20 m after Zomet Iron you have to turn left (eastwards). Now you drive northwards through a tunnel under road 65. You reach the memorial immediately after the tunnel (map with directions). The long wall of the memorial is inscribed with a quotation in Hebrew from Jeremiah 15:20: (God speaks:) "And I will make thee unto this people a fenced brasen wall: and they shall fight against thee, but they shall not prevail against thee." Recently the border troop museum has been opened near the memorial. This very interesting museum shows the history and achievements of the border troops, which are made up of all nationalities living in Israel (including a high percentage of Druzes). It gives you an idea of the new challenges due to terrorism originating from the areas controlled by the Palestinian Authority. Furthermore several films are shown there, available in Hebrew and English such as the entire documentation presented. The museum was founded in commemoration of all border troop soldiers killed in action including the Christian Zionist Yonathan Vermeulen, who was killed on 29th December 2000. Sergeant Yonathan Vermeulen grew up in the Christian moshav Nes Ammim in Western Galilee. In 1975, at the age of four, he came to Israel from the Netherlands together with his parents, who are Christian Zionists. An official Jewish National Fund (KKL) poster advertising tree planting in Israel shows little Yonathan planting a small tree. In 1990, as Nes Ammim accepts volonteers only for a period of several years, the Vermeulen family returned to the Netherlands. Yonathan, however, felt that he did not belong there; in fact he was longing very much to return to Israel. After several obstacles had been overcome, the Israeli army Zahal fulfilled his dearest wish, that is to serve as a regular Zahal soldier in a special border troop pioneer unit which is exposed to particularly high risks. His job included the defusing of Arab bombs. On 29th December 2000, Yonathan Vermeulen, together with another soldier, had to defuse a roadside bomb in the Gaza Strip. This time, however, Palestinian "Intifada" terrorists were lying in ambush, and as the bomb defusing team was trying to render the bomb safe, they triggered off one bomb and then another one. Thus 29-year-old Yonathan was killed immediately. He was buried in the kibbutz Hanita, which just on the Lebanese border has made numerous sacrifices for Zionism and the State of Israel for many years. The funeral was held in a really ecumenical way: a Dutch catholic priest held the service together with a military rabbi. The rabbi sang Jewish prayers. Yonathan received all military honours from his comrades. The kibbutz inhabitants said that they had felt honoured by the ceremony taking place near their homes. Megiel, Yonathan´s mother, said: "this is the Holy Land. We have always felt we have a special relationship with it; indeed after what has happened, we have a kind of blood relationship which will never be destroyed. We are proud of Yonathan." In the museum, feel free to ask for Yonathan´s personal file. It is accessible to every visitor, and contains numerous moving pictures and documents regarding his life. The museum is open from Monday to Thursday, from 9 am to 4 pm Entrance is free of charge. Fax. no. 06 6355749. The Nachal Brigade Memorial is located on the outskirts of Pardes Hanna-Karkur. In addition to their military service, the Nachal soldiers are also engaged in farming and in the foundation of agricultural settlements. The Nachal emblem is inscribed with the quotation from Joel 4:13 (3:13): "Put ye in the sickle, for the harvest is ripe." The name "Nachal" is an abbreviation of "No'ar chaluzi lochem" ("fighting young pioneers"). Above the names of the soldiers killed in action, you can read a quotation in Hebrew from Isaiah 56:5: (God speaks): "Even unto them will I give in mine house and within my walls a memorial and a name." Driving northwards in Pardes Hanna-Karkur in the main street 652, you turn west in the north of the town, and take the street 651 leading uphill. You will see the memorial on your right-hand side before reaching the railway bridge. In Zichron Ya´aqov ( זכרון יעקב ) south of Haifa, there is the artillery museum of the Israeli army (Bet HaTotchan). The names of the soldiers killed in action are listed on a memorial in this place. In front of them, you can read a quotation from 2 Samuel 23:8 in capital letters: "These are the names of the heroes." The museum is located in a quite hidden place. When you are in the city centre, follow the historic founder street (HaMeyasdim street) as far as its southern end until arriving at a roundabout. There, turn south-east into Aharon street (towards Binyamina). After about 500 m, turn left into a narrow street, along which you will find a school, a citizen´s centre, the "Sportan" sports centre and behind them the artillery museum. Opening hours: Sunday - Thursday: 9 am - 5 pm; Friday: 9 am - 1 pm; Shabbat and Jewish holidays: 10 am - 3 pm. In Haifa, there is the Clandestine Immigration and Naval-Museumm (telling also thhe story of the Ma'apilim, who were Jews who, after having escaped the Holocaust, secretely immigrated into Israel on boats, taking the risk of being intercepted by the British). This museum gives a moving presentation of the sufferings of the Ma'apilim and shows numerous quotations from the bible. Right at the entrance, you can see an open book of stone inscribed with the verses 3, 16, 23, 26, 27, 29 and 30 from Psalm 107 in Hebrew: "And He (God) gathered them out of the lands, from the east, and from the west, from the north and from the sea. For He had broken the gates of brass, and cut the bars of iron in sunder. They that go down to the sea in ships, that do business in great waters; - they mount up to the heaven, they go down again to the depths, their soul is melted because of trouble: - they reel to and fro, and stagger like a drunken man, and all their wisdom is swallowed up. He (God) makes the storm a calm, so that the waves thereof are still. Then they are glad because they be quiet; so he brings them unto their desired haven." A showcase contains information about the way Jews preserved and practiced their religion despite all the hardship they suffered while immigrating into Israel. In the showcase, you can see a Hebrew prayerbook printed in Germany together with a quotation from Leviticus 22:31: "Therefore shall ye keep my commandments and do them." in Hebrew and English. Another showcase contains photos of immigrants arriving by plane or transported by trucks to the building site of a kibbuz. A quotation from Zecharaiah 8,7: "Behold I will save my people from the east country and from the west country." in English and Hebrew is also shown in this place of the museum. Additional signboards are inscribed with the following quotations from the bible in Hebrew and English: Psalm 111:9: "He sent redemption unto his people. "; Isaiah 60:11: "Therefore thy gates shall be open continually; they shall not be shut day nor night." and Ezekiel 28:25-26: "When I shall have gathered the house of Israel from the people among whom they are scattered.... then shall they dwell in their land... and shall build houses, and plant vineyards." The Clandestine Immigration and Naval-Museum is located in the north-west quarter of Haifa, down at the beginning of Allenby Street, near the sea. It is open from Sunday to Thursday from 9 am to 4 pm. Website. The technical university "Technion" in Haifa invites you to go to the "Coler California Visitors' Center". There films and computer programmes demonstrate how the technical development in Israel is progressing with God's help, thus making Zionism stronger. In the entrance hall, a large signboard is inscribed with a quotation from Proverbs 3:13 in Hebrew and English: "Happy is the man that finds wisdom and the man that gets understanding." The visitors' centre of the Technion is open from Sunday to Thursday from 8 am to 3.30 pm. The Technion is located in the south-east quarter of Haifa on a slope of the Carmel Mountains. The way to it is clearly signposted. In Haifa the memorial of the MedicalCorps is situated. It is inscribed with a Hebrew Bible verse from 2 Samuel 1:19: "The beauty of Israel is slain upon thy high places. How are the mighty falllen!" In Nahariya on the seafront, there is a memorial to the Ma'apilim (see above) ("Beach Immigration Monument") who reached this part of the coast. The memorial consists of rocks lying on one another and birds of metal freely flying over them and is sistuated on a small mole. A quotation from Jeremiah 31:17: "And your children will come again to their own country." is inscribed on one of the rocks to the right. The memorial is located on the beach, a little south of the place where Margo'a Street branches off from HaMa'apilim Street. You get direct to the memorial by walking along the fence of the police barracks. The hotel "Eshel HaShomron" (in English: "the tamarisk tree of Samaria") is located near Ariel. Its name was chosen in remembrance of the fact that Abraham planted a tamarisk tree immediately after immigrating into the Promised Land of Israel (Genesis 21:33). In the parking lot there is a signboard inscribed with a quotation from Jeremiah 31:5 in several languages: "Again you shall plant vineyards on the mountains of Samaria." Beside it, you can already see small vines visitors have planted in support of Israel. Beside the hotel, You'll find also a big Bible Garden. At the entrance of Tel Yizre'el (beside kibbutz Yizre'el, south of Afula) You'll find 2 big plates inscribed in Hebrew with the 2 main stories of this old capital of the northern kingdom of Israel: 1 Kings 21 ("Naboth's vineyard"); 2 Kings 9:17-34 ("Jehu's revolt"). In Afula the memorial of the 900th("Kfir") brigade is situated. On the wall to the left a Bible verse is inscribed - from 2 Samuel 1:23: "They were swifter than eagles, they were stronger than lions." The wall to the right is inscribed - fitting to the brigade's name - a verse from Amos 3:4: "Does a lion roar in the thicket, when he has no prey? Does a young lion (kfir) growl in his den, when he has caught nothing?" To visit the museum and to get inside the other historical buildings, You have to call in advance: 0 52 36 38 156 or 04 65 98 882. At the Bet Sturman museum in the Kibbuz En Harod (עין חרוד ) (on the road 71 between Bet Shean and Afula) Charles Orde Wingate´s bible is exhibited. Wingate was a British army officer and a reborn, Bible-believing Christian who supported zionism and the Jewish self-defence forces out of his Christian faith. He founded and trained a special night squadron for fighting terrorists. He took as an example Judge Gideon in particular, who, together with the Israeli army, had set up his camp in this area, near the source En Harod in order to fight against Midianite invaders; the kibbuz was named after this source. The biblical report is illustrated at the above museum. After Wingate had fallen in World War II, his wife wanted to have his Bible dropped with a parachute over a kibbuz besieged in Galilee in order to encourage the kibbuz inhabitants. The Bet Sturman museum is open from Sunday to Thursday from 08:00 am to 03:00 pm and on Saturdays from 11:00 am to 03:00 pm. The headquarters of the anti-terror unit “SNS” established by Mr. Wingate is located below the museum: Just pass by the two houses beside the museum, then cross the street. A plaque entitled “Base Special Night Squads S.N.S,” explains the function of the building. In Naharayim (נהרים), where the Yarmuk flows into the Jordan - near the Kibbuzim Ashdot Ya'aqov ( אשדות יעקוב), some kilometers south of the Sea of Galilee, one finds a memorial for the 7 twelve-year-old Israeli girls murdered by a Jordanian border guard in March 1997. For every girl a flower-bed is planted on which the name is written with flowers of different colours. On boards you'll also find several Bible verses: " it is a holy sacrifice, a holy sacrifice of the Israelites shall it be... " (Exodus 29:28); "He shall enter into peace; they shall rest in their beds:"(Isaiah 57:2). On one board, you can see photos of the 7 girls with a quotation from Psalm 1:3: "And he will be like a tree planted by the rivers of water, which brings forth his fruit in his season; his leaves will not wither." Board with the girl's photos and Ps 1:3. In the back You see the names, written by flowers. Driving on the road 90 (Bet Shean - Lake Kinnereth) , one has to turn off the road at the southern end of Kibbuz Ashdot Ya'akov Ichud at the sign " Peace Island ". Some hundred meters behind the sign, you'll reach the described memorial. In the Founder Museum of the first Kibbuz, Deganya (דגניה), you'll find a photo from the pioneer period with the Bible words from Ezekiel 36:34: "The desolate land shall be tilled. " In this museum, there is also a board commemorative of the defenders of the Kibbuz who fell during the War of Independence (The famous Syrian tank is in the background of the board.). This board is inscribed with words from 2 Samuel 1:27: "How are the heroes fallen! " The museum is open Sunday to Friday 9 a.m. to 1 p.m. Right at the entrance to the cemetery of Kibbuz Deganya (where the famous poet Rahel is buried) - just beside Jordan river, along the main road and the driveway to Yardenit - there is a memorial wall inscribed with a Bible verse (in Hebrew) taken from Jeremiah 31:20: "Though I often speak against him, I still remember him." In kibbutz Sha'ar Hagolan You find at the eastern part the famous historical watchtower (spot no 12 on the historical kibbutz path). Beside this watchtower there is a small planting of young trees with a plate and the words "Benjamin Generation" and mentioning Psalm 68:26-27 ("Praise God in the great congregation; praise the Lord in the assembly of Israel. There is the little tribe of Benjamin, leading them, there the great throng of Judah's princes and there the princes of Zebulon and of Naftali."). In the Kibbuz Tel Qazir (תל קציר ) at the south-east end of Lake Kinneret (Sea of Galilee), there is a small museum, where the history of the kibbuz is presented with the emphasis placed on the critical period from 1948 to the conquest of the Golan Heights by the Israeli army in 1967; during this period, the kibbuz had to survive while being continually pounded by the Syrian artillery. In the kibbuz, you can see a photo taken after 1967 of a Syrian artillery position overlooking Israeli territory including the Jordan valley and Lake Kinneret. This photo is inscribed with a quotation from Ezekiel 34:27-28:"God speaks: And they shall be...in their land...and they shall dwell safely, and none shall make them afraid." The museum is small, but has very interesting exhibits. The history of the kibbuz reflects the difficult beginnings of the State of Israel. The museum can also be visited by groups, but does not have fixed opening hours. You have to arrange your visit beforehand with Mrs. Dvora Ortenberg (phone in Israel: (06) 675 68 09), who is also fluent in English. In Tiberias (טבריה), at the crossing HaYardenStr./HaAtzma'utStr., beside the main post office you can find a memorial with an old cannon from the War of Independence . Psalm 2:7 is inscribed there: " You shall break them with a rod of iron; you shall dash them in pieces like a potter's vessel." In Tiberias you can see a multi-media show concerning the history of the Galilee from Abraham to the present time. The show is clearly based on the Bible. It is very deep and very moving. The modern zionism is explained on the basis of the Bible, too. This show is presented in many languages: English, Hebrew, French, Spanish, German, Dutch, Norwegian, Finnish, Korean, Russian, Japanese and Portuguese. You can see this multi-media show in the cinema of "Galilee Experience". (Galileeexperience) It is situated in the city center on the shore of the Sea of Galilee, at the sea promenade (Tayyelet Yig'al Allon), in the building which was built into the lake beside the Marina port. You'll find "Galilee Experience" on the first floor, where You can buy Biblical items and products from the Land of Israel, and the entrance is situated on the town-side, not on the sea-side. Galilee Experience is open from Sunday to Thursday from 9 a.m. to 11 p.m. and on Friday from 9 a.m. to 3 p.m..
A KKL tree plantation where everyone can plant a tree in the Land of Israel according to Isaiah 41.19 and Ezekiel 36.8 is located near Golani Junction. Planting one tree costs about $ 10. On a small hill in the plantation, there is a memorial to South African volunteers of the Israeli army who were killed in action. Above the names of the fallen, you can read a quotation from Ezekiel 16:6: "God speaks: I said to you, when you wast in your blood : Live!" The plantation is clearly indicated by signs, and is located near the road 77 to Tiberias around 1 km east of Golani Junction. Normally, the plantation is open during the day. In the museum of the Golani brigade at the Golani (גולני) Junction (crossing of the roads 65 and 77), the verse of Psalm 18:35 is inscribed on the right side of the main monument: " He (God) teaches my hands to fight and my arms to bend the bow of steel. " The museum is open Sunday to Thursday 9 a.m. - 4 p.m.; Friday 9 a.m. - 1 p.m.; Shabat 9 a.m. - 5 p.m.. In the kibbutz En Gev on the east shore of Lake Kinneret (Sea of Galilee), there is a memorial for the IDF (Israeli Defence Forces). This memorial is also intended to commemorate the enormous sacrifices the kibbutz En Gev had to make until 1967, as at that time it was squeezed between Lake Kinneret and the Syrian guns, which were only a few hundred metres away. Beside the memorial, there is a sculpture showing a woman holding a child upwards, and a Davidka, a mortar which was then built by Israel. The wall of the memorial is inscribed with a quotation in Hebrew from Nehemiah 4,12: "For the builders, every one had his sword girded by his side, and so builded." Facing the entrance of the well-known fish restaurant on the shore of the lake, you can see on your left-hand side the path which leads to the memorial. Walk straight ahead along this path until you reach a cinema building with a curved wall. Follow this wall, then go straight ahead, finally turn right. At the end of the path, you will see Lake Kinneret and the army memorial. Biblical Bethsaida (בית-צידה) (e.g. Luke 9.10) has now been excavated and became part of a national park; you can visit the illustrated excavations. What is special about this place as compared to other archaeological sites is the fact that it is illustrated with numerous quotations from the Bible. The excavations of Bethsaida are in the HaYarden park. When driving from the west to the east, you cross the Jordan river just north of Lake Kinneret, then you soon turn left (northwards) into the road 888, which runs parallel to the Jordan river. After several hundreds of meters, a sign indicates the park HaYarden. Immediately behind the check point, you turn left; then, after approx. 500 m, you will reach the excavation site of Bethsaida. Opening hours: Daily 8 am to 4 pm. Websites: Nature Reserve and http://bibleplaces.com/bethsaida.htm. The memorial of the 7th brigade on the Golan Hights near Qazrin-Junction on the road 87 (In the Yom Kippur war, the Syrian troops advanced as far as this place) is inscribed with a quotation from Isaiah 66:15: "He (the Lord) will come with fire, and his chariots like a whirlwind." The Memorial of the 188th ("Barak") Brigade is situated in the Golan Heights at Road 91 near the entrance to Nahal Gilbon . It is inscribed with a verse from a Hebrew song, citing Jeremiah 17:8: "A person is like a tree planted by water, seeking roots." The pedestrian precinct of the town Zefat is called "Yerushalayim". It offers a panoramic view, and is also the location of a memorial commemorating the combats which took place in Zefat during the War of Independence. There, you will notice a Davidka, a simple mortar the Israelis built by themselves at that time. The balustrade beside it is inscribed with a quotation from Jeremiah 1:18: (God says:) "For, behold, I have made thee a defenced city, and an iron pillar, and brasen walls ." The name of the town Rosh Pina, which was founded in 1879 as one of the first Zionist settlements, means “cornerstone”. This word is quoted from the bible (Psalm 118,22) (See below chapter 2..). This quotation is written on the lower edge of the municipal coat of arms (picture). You can see the coat of arms everywhere in the town. In Ha´irus street, directly opposite the town´s historic core established in 1880, which is called “Moshawa Rishonim", you can enjoy a magnificent view of the Hule valley. There, you can also see a memorial stone with a quotation from the bible (Jeremiah 17,8). In the Upper Jordan Valley north of the Lake Kinnereth lies the Dubrovinfarm. The Dubrovins, a Christian family from Russia, immigrated in the last century, in order to support Israel and the zionism. They built their farm in the Hule Valley (big swamp) where most of the first settlers did not survive. In this museum farm you can see a slide show (at least in Hebrew, English and German), from which you can learn a lot about the biblical faith of the first settlers as a basis for their hard work and perseverance and about how zionism's efforts to cultivate and replant the Hule Valley were blessed by God with success. The Dubrovin farm is opened daily from 9 a.m. to 4 p.m..
You can reach the Dubrovin farm via the main road 90 between Lake Kinnereth and Metulla. Coming from the south, one passes the junctions to Yesud HaMa'ala (right hand) and to Sede Eli'ezer (left hand) driving further to the north. At the next junction, one finds among other signs the sign of the Dubrovin farm and one turns right, off the road 90. In the northern part of the Hule valley, take the main road no. 90. At the Zomet Koah junction, turn into a winding road which leads uphill to Upper Galilee. At the highest point of the road, you will notice a junction where you could turn left to Zefat. Just before this junction, turn right into the road to the old fortified police station Mezudat Yesha, also called Mezudat Koah or in Arabic Nebi Yusha. Fierce combats took place there, during the War of Independence. One wall of the memorial up there is inscribed with a quotation in Hebrew from 2 Samuel 1:19: "The beauty of Israel is slain upon thy high places. How are the mighty falllen." Recently a modern, very moving museum with a historical movie was added. At the memorial wall for the fallen inside the museum, the same Bible verse from 2 Samuel 1:19 is quoted. This place also offers a breathtaking view of the Jordan and Hule valleys and there is a nex path from the valley following the march of the fallen. On 4th February 1997 a heavy collision of 2 helicopters took place. The helicopters crashed, blazing fiercely, near the Kibbuz Shear Yashuv . In fact, all the 73 soldiers in the helicopter died in the accident, but by a miracle none of the kibbuz inhabitants was even injured. Despite the terrible deaths of the soldiers the kibbuz inhabitants showed their faith in God's help and protection by thanking Him for having preserved all of them and by erecting in the place of the accident a sign inscribed with the following quotation from Psalm 91:11: "For he will give his angels charge over you, to keep you in all your ways." To find this place, enter the kibbuz Shear Yashuv; then turn left approx. 100 m behind the gate, following the first street; about 50 m further away, you can see the memorial on your left-hand side. To get to the place where the other helicopter crashed, drive along the left side of the cemetary of the nearby kibbuz Dafna. The route to the crash site of the second helicopter is perfectly signposted with “Helicopter Memorial”. Turn off the main road 99 between the kibbuzim HaGoshrim and Dafna, then drive by the cemetery of kibbuz Dafna in order to arrive at an artistically fashioned area with a creek and memorial stones for the soldiers killed there. The main memorial stone is inscribed with a quotation from the bible: "They are joined fast to one another; they cling together and cannot be parted." (Job 41,17). These Bible verses were all inscribed in public by Jews. From Christians the wonderful multilingual inscriptions (called "Rufer"-boards) of the Sisters of Mary from Darmstadt/Germany are found in many places. The name of the settlement/village/town is taken from the Bible verse, mentionned after the year of foundation. Lod (Ben-Gurion-Airport), existing since Biblical times: 1 Chronicles 8:12; Acts 9:32. The coat of arms (picture) is inscribed with Biblical words from Jeremiah 31:17: "The children will return to their country." Rishon le Zion, founded 1882, named after Isaiah 41:27. The coat of arms (picture) is inscribed with words from Genesis 26:32: "We have found water." Rehovot, founded 1890, named after Genesis 26:22, which is inscribed in the coat of arms (picture): "And he called the name of it Rehovot; 'For the Lord had made room for us." Hadera, founded 1891, Psalm 126:5 is inscribed in the coat of arms ((picture)): "Those who sow in tears, will reap with songs of joy." Dan, founded 1939, named after a biblical town, excavated at this place, f.e. 1 Samuel 3:20. Rosh HaAyin, founded 1949. The coat of arms (picture) is inscribed with Biblical words from Exodus 19:4: "I (God) carried You on eagles' wings." Or Akiva, founded 1951. The coat of arms (picture) is inscribed with Biblical words from Job 8:7: "Your beginnings will be humble, so prosperous will your future be." Alona, founded as regional council in 1953. The coat of arms (picture) is inscribed with Biblical words from Psalm 126:5: "Those who sow in tears, will reap with songs of joy." Schomron, founded as regional council in 1979. The coat of arms (picture 1 and picture 2) is inscribed with Biblical words from Jeremiah 31:5: "Again You will plant vineyards on the hills of Samaria." Yehud-Monosson, merged of 2 towns in 2003 (Yehud und Newe Monosson themselves were founded in 1953). The coat of arms (picture) is inscribed with Biblical words from Genesis 49:8: "Judah, your brothers will praise you; your hand will be on the neck of your enemies." During the 70 years of the state of Israel hundreds of stamps, inscribed with Bible verses (either on the stamp, on an appendix or on its FDC), were edited. During the next months this list will be completed with the missing years - step by step, and it starts with the first and the present years of the State of Israel (1949, 1950, 1951, ..., 2016, 2017 und 2018). If You want to get already now the complete list of Biblical stamps - however in a simple way, You can write me a mail to the address, mentionned at the end of the page. FDC: (hebr) Psalm 122:3: "Jerusalem is built up as a city united together." Appendix: (hebr) Deuteronomy 26:8: "(And the Lord guided us) with a mighty hand, with an outstretched arm, with great power." Appendix: (hebr) Proverbs 23:23: "Invest in truth." Appendix: (hebr) Nahum 2:1: "O Judah, keep your feasts!" 26.12.., 500 Pr, "Opening of the Post Office in Eilat" (No.54), (hebr) Isaiah 43:20: "For I provide water in the desert." Anhang: (hebr) Leviticus 25:23: "The land must not be sold permanently." FDC (hebr, engl): Jeremiah 18:6: "Just like clay in the hands of the potter, so are you in My hands, O House of Israel!" FDC: (hebr, engl): 1 Kings 9:26: "King Solomon also built a fleet of ships at Ezion-geber ..."
FDC (hebr, engl): Song of Songs 4:14: "... with all aromatic woods, myrrh and aloes - all the choice perfumes." FDC: (hebr, engl) Psalm 122:2: "Out feed stood inside your gates, O Jerusalem." Appendix (hebr): Jeremiah 31,20: "(The Lord says:) Though I often speak against him, I still remember him." Appendix: (hebr): Psalm 118,22 "The stone the builders rejected, has become the capstone." FDC: (hebr, engl) Ezekiel 36:28: "You shall dwell in the land, which I gave to your fathers." FDC: (hebr, engl) Genesis 3:14: "On Your belly shall You crawl." Appendix: (hebr, engl) Leviticus 25:36: "Let him live by Your side as Your kinsman." FDC: (hebr, engl) Zechariah 4:2-3: "A lampstand all of gold ... and by it are two olive trees." You will find pictures of all stamps also on the website of Delcampe, where You can order the stamps. Stamps of the last years can also ordered directly from the Israel Post, in this list You find all (not only these connected to the Bible) stamps from the year 2000. You find an interesting compilation of some important Biblical Israeli stamps (in the order of the Biblical sriptures) on the website "The Bible Odyssey on Israeli Stamps". If You want to read the small homepage concerning the 70th birthday of the State of Israel celebrated in 2018 (and the 120th anniversary of the 1st zionist congress celebrated in 2017), please click on this sentence. An Israeli, 75 years old, writes on the occasion of the 70th birthday of Israel: "I hardly recognize the poor country of my childhood, where most people could not speak Hebrew and we depended on donations and lownes for importation of food. Reality is beyond the wildest dreams of the founding fathers. God's miracles are breath taking." As owner of this website, I give hereby the copyright and the right of distribution of this website to every reader, if the address of this website is cited (not necessary to ask me. If You use citations or links of this website, You must also mention the source, mentionned in this website.) – because I have no commercial interest, only an interest in ideas. I can’t check always the other websites, which are linked on this website. So, we aren’t responsible for these contents. As soon as we know any illegal content, we will delete this link. We take the protection of your personal data very seriously. We treat your personal data as confidential. Your data will be stored for 8 weeks and not be transmitted to third parties. Additionally the data is processed by 1&1 WebAnalytics (https://hosting.1und1.de/hilfe/datenschutz/datenverarbeitung-von-webseitenbesuchern-ihres- company-name-produktes/webanalytics/) without using cookies by a pixel or a logfile. What rights do you have regarding your data? You always have the right to request information about your stored data, its origin, its recipients, and the purpose of its collection at no charge. You also have the right to request that it be corrected, blocked, or deleted. The basis for data processing is Art. 6 (1) (b) DSGVO.